PanARMENIAN.Net - Ameria CJSC is serving the exclusive partner of the Global Entrepreneurship Research Association (GERA) in Armenia starting from 2019. This means that throughout the year in-depth and comprehensive research in the field of entrepreneurship will be conducted in the country for the Global Entrepreneurship Monitor (GEM) report. In addition to presenting the indices of Armenian entrepreneurship, the report will also feature a National Report for the country to provide a more detailed analysis of the business sector. GEM is an annual survey that has been conducted for the past 19 years. It is a reliable source of comprehensive business and entrepreneurship indicators for economic policy makers in countries, as well as for international organizations such as the United Nations, the World Economic Forum, the World Bank and the Organization for Economic Cooperation and Development (OECD). At present, more than 100 countries, including Germany, Sweden, Switzerland, Ireland, Canada, the United States, as well as Iran, Russia, Turkey and Georgia are involved in GEM research. The research and related reports enable policymakers and other stakeholders to get a more detailed look at the peculiarities of entrepreneurship in a given country, comparing it with business developments in other countries. This is one of the preconditions for the implementation of more effective and justified measures for the development of the sector. 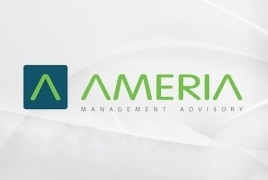 Ameria will be GERA’s exclusive partner in Armenia for the coming five years.